Focus 80% of your hiring and recruiting efforts on the most important 20% of the talent market. When companies don't follow this rule, they overpay and work too hard to hire average candidates. This entire concept is summarized in this graphic. It doesn’t take much research to discover that the best candidates come from referrals, as shown in the graphic. Direct sourced is the second best approach, with job postings coming in dead last. For example, at last week’s SmartRecruiters.com annual users conference one speaker asked the audience of 800+ recruiters how many of them got their current jobs via a referral and two-thirds raised their hands. More proof: This survey we’ve been running for five years continues to show that only 11% of fully-employed people found their jobs by applying directly. It’s much worse for managers and executives. A bigger research project I worked on with LinkedIn a few years ago with more than 20 thousand respondents clearly showed that less than 20% of the fully-employed total talent market would apply to a job posting. It was around 5% for high demand positions. These results aren’t surprising. What is surprising is that while most companies know these same facts they still spend 80% of their resources trying to improve the job posting process and the overhead and wasted time that comes with it. 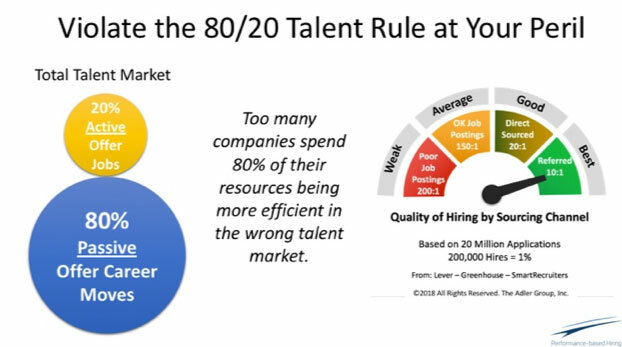 The simple premise embodied in the 80/20 Talent Rule is that in order to raise quality of hire you need to spend 80% of your entire hiring resources, i.e., time, people, money and effort, on the best 20% of the talent market. Making the shift first starts by recognizing there are two talent markets. The active market is the job market shown in the yellow circle in the graphic. This talent marketplace offers ill-defined lateral transfers to candidates who have an economic need to apply and are willing to play the lottery to get another job. This is a transactional market with price and box-checking of skills and experiences as the medium of exchange. The other talent market, represented by the blue circle, offers career opportunities. This market is less visible. It’s formed initially when a manager decides to hire someone. The manager first tries to fill it internally or via a referral or reaches out to someone he/she knows. If this first step approach fails, the manager will post the job or reach out to a staffing firm. The gauge shown in the graphic summarizes the result of this process. In the career market – represented by the right side of the gauge – quality of hire and efficiency are far superior to the job posting approach to sourcing. 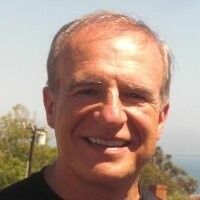 Lever (an ATS) published some interesting confirming research last year indicating that in most cases it only took 10 or so referrals to make a great hire and 150 or more applications via a job board to make a decent hire. If you decide to argue the research or want to see more stats, first check out Gallup’s 20 year study on what drives on-the-job performance or Harvard professor Todd Rose’s remarkable book, The End of Average. As long as you’re objective, you’ll quickly come to the conclusion that job postings should only be used to fill the least important rank-and-file positions. Minimizing your use of job boards needs to be your first step in implementing the 80/20 talent rule. Start by eliminating individual job postings and bundling all related jobs together in a microsite and/or a master job posting. Don’t offer candidates the opportunity to apply directly. Instead, ask them to submit some type of work sample or a description of a major accomplishment related to the job family as an expression of interest. The system, or a recruiter, will then determine if a suitable job is available. This prerequisite alone will reduce the number of unqualified people by 80-90% and allow you to create talent pools of highly qualified followers. I had the #1 labor attorney in the U.S. validate this two-step no apply process as part of The Essential Guide for Hiring. With this process underway, you’ll then be in a position to implement more sophisticated direct sourcing and referral programs to target the 80% passive talent market. This is a high touch consultative process that requires skilled recruiters and engaged hiring managers to balance the requirements of the job with the career needs of the people being considered. Redirecting your efforts to fully comply with the 80/20 Talent Rule will help every company, talent leader, hiring manager and recruiter improve quality of hire, increase diversity hiring and improve on-the-job satisfaction and performance. It’s certainly a different approach, but if you agree with the Talent Rule concept and all of the related research, it’s one that needs to be taken.